The Wicked City was such an absorbing tale that I fairly raced through it to see how it would all come to an end. 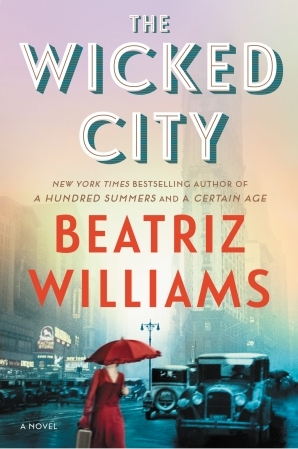 New York Times bestselling author Beatriz Williams recreates the New York City of A Certain Age in this deliciously spicy adventure that mixes past and present and centers on a Jazz Age love triangle involving a rugged Prohibition agent, a saucy redheaded flapper, and a debonair Princetonian from a wealthy family. When she discovers her husband cheating, Ella Hawthorne impulsively moves out of their SoHo loft and into a small apartment in an old Greenwich Village building. Her surprisingly attractive new neighbor, Hector, warns her to stay out of the basement at night. Tenants have reported strange noises after midnight—laughter, clinking glasses, jazz piano—even though the space has been empty for decades. Back in the Roaring Twenties, the place hid a speakeasy. In 1924, Geneva "Gin" Kelly, a smart-mouthed flapper from the hills of western Maryland, is a regular at this Village hideaway known as the Christopher Club. Caught up in a raid, Gin becomes entangled with Prohibition enforcement agent Oliver Anson, who persuades her to help him catch her stepfather Duke Kelly, one of Appalachia’s most notorious bootleggers. Headstrong and independent, Gin is no weak-kneed fool. So how can she be falling in love with the taciturn, straight-arrow Revenue agent when she’s got Princeton boy Billy Marshall, the dashing son of society doyenne Theresa Marshall, begging to make an honest woman of her? While anything goes in the Roaring Twenties, Gin’s adventures will shake proper Manhattan society to its foundations, exposing secrets that shock even this free-spirited redhead—secrets that will echo from Park Avenue to the hollers of her Southern hometown. As Ella discovers more about the basement speakeasy, she becomes inspired by the spirit of her exuberant predecessor, and decides to live with abandon in the wicked city too. . . This is the third book I read by Beatriz Williams. The first one was Overseas which had a rocky start for me, and the second was A Hundred Summers, which I really liked. It seems that Williams' writing gets better and better. The Wicked City was such an absorbing tale that I fairly raced through it to see how it would all come to an end. Beatriz Williams has the talent for weaving alternating stories from the past to the present so that the reader is trying to figure it all out as the clues unfold the story before us. I love this technique because it builds suspense, mystery and intrigue. In The Wicked City, we begin with Ella's story in 1998, a forensic accountant who catches her husband cheating on her. She leaves him and moves into a building she later discovers used to have a speakeasy in its basement. A speakeasy is a saloon or nightclub that used to sell alcoholic beverages illegally, especially during Prohibition. Then we move on to Geneva "Gin" Kelly's story in 1924, a flapper who frequents the said speakeasy until it's raided. She ends up in jail and then takes up the offer from the straight-arrow Revenue agent Oliver Anson to catch her stepfather Duke Kelly, who just happens to be the man she ran away from and who is known to be a notorious bootlegger. I liked Gin's story because she is such a great and complex character. She tells her story from her point of view, talking straight to the reader with her wry sense of humor and witty observations. She's a survivor and one can easily overlook her faults because she is also vulnerable and there's a softness to her hard edge. I loved the setting of course, during the Roaring Twenties, such a dynamic time in history. And the clever dialogue and repartees! Think Humphrey Bogart and Lauren Bacall. Gin is a smart-mouthed, independent and modern 1920s woman. I like stories with dual timelines, and this was no exception. I liked both Ella and Gin's story, although this time, the connection between the past and the present was tenuous. I was waiting for it, the connection that would tie it all together but there wasn't much. As a matter of fact, if the present story had been left out, it would not have made a difference to that of the past. So the ending...well, it left me wanting more. It left me with questions. I felt that there were some unresolved issues, some plot threads left hanging. I don't know. Despite all this, I really enjoyed this novel. The author kept me engaged throughout and I was so into Gin's story that I was disappointed when it ended. I look forward to seeing if Williams will write another period piece with a dual timeline, as I am eager to read more. 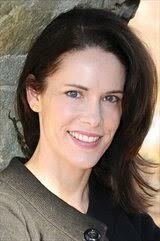 A graduate of Stanford University with an MBA from Columbia, Beatriz Williams spent several years in New York and London hiding her early attempts at fiction, first on company laptops as a communications strategy consultant, and then as an at-home producer of small persons, before her career as a writer took off. She lives with her husband and four children near the Connecticut shore. Find out more about Beatriz at her website, and connect with her on Facebook, Twitter, and Instagram. I've got to get my hands on this one! I've enjoyed a couple of her books so I'll put this one on my To Read list. My TBR list is growing thanks to your reviews! I always enjoy Ms. Williams' books.